This is the most extensive and detailed guide on investing in pre-construction condos in Toronto. We want to be the number one source of information for pre-construction condominiums. Our team meets with hundreds of investors for new condos every year and there is one common statement that we hear time and time again; there is no one place to get all the information that you need to get started in investing in pre-construction condos. We want to be your one stop for information and give you the best access to the best new condo projects in Toronto. This guide is for anyone interested in pre-construction condominiums. We share details, tips and tricks about investing in Toronto that work for every level of condominium investor whether you’re just getting your feet wet, or even if you have purchased new condos in the past. We feel there is something for everyone. Chapter 1 (This Chapter) – Why Pre-Construction and why Toronto? CHAPTER 1 – Why Invest in Pre-Construction Condos in Toronto? Before we start talking about anything, it is important to understand why pre-construction condo investing is so popular and what makes it so unique. The first step to investing in new condos is to understand the investment vehicle to make sure that it makes sense for you. There are many factors that make the Greater Toronto Area such a unique area to invest and we will highlight four key points on why we believe the prices and rentals will continue to grow in the coming years. Pre-construction condominiums have become a very popular form of investing with approximately 20,000 new condos being sold every year. There is HUGE demand for the best projects every year where investors feel that they can get the best returns (we will talk more about how to choose the best projects later in this guide). We ourselves invest in multiple new condos and there are a variety of reasons that we make this our investment of choice. Managing multiple condominiums is a passive form of investing and can be done with very little man hours. Pre-construction allows you to purchase brand new condos that are often priced higher than existing resale condos once built (because buyers want to be in the “newest building”) and allow investors to make significant profits by purchasing below resale buildings. This effectively allows you to “buy at a discount and sell at a premium”. Note, not ALL pre-construction condominiums are great investments so it is important to understand how to pick the projects that will help maximize your returns. There is no mortgage or loan required during the duration of construction – this is almost like getting an 80% interest-free-loan for the duration of construction on an appreciating asset. To purchase a condominium at $300,000, your investment is just $60,000 (20%). For a condominium that is $350,000, your investment is $70,000 (and so forth). From an investment standpoint, it means that for every dollar that you put towards the condominium, the developer is putting in $4. It means that you essentially have an 80% interest free loan from the developer for the duration of construction on an appreciating asset. Why Invest in a Toronto Condominium? In 2005, the province instituted the ‘Places To Grow’ policy, which froze 7,200 square kilometers of land (called the ‘Greenbelt’) for development, in an effort to protect the land, and to increase intensification. To help put some perspective on the size of the Greenbelt, it covers an area larger than Prince Edward Island. The policy created a major shift in how developers were able to use the land inside the Greenbelt. Prior to the 2005, most new development was sprawling low rise development, but the new protected lands meant that for the first time there was scarcity of land inside the Greenbelt. This means developers were forced to build low rise OUTSIDE the greenbelt (North of Newmarket, etc.) or build high rise INSIDE the greenbelt (in the GTA). Looking back to the mid 1970’s, there has always been approximately 40,000 new home sales, but the composition of what the developers are building has changed. Since then, on average, each and every year, the number of low rise has declined, and the number of highrise has increased, averaging out in the 40,000 total range. This ’40,000’ number has remained relatively constant since the 1970’s. 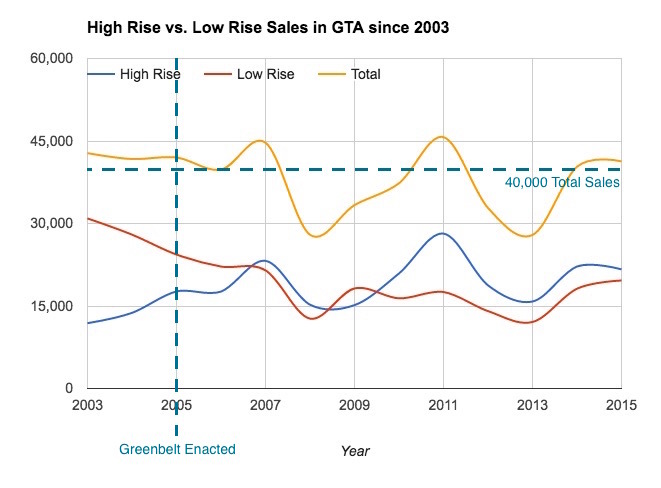 The graph below shows the impact of the Greenbelt on the composition of development in the Greater Toronto Area, with 2007 (two years after the Greenbelt was enacted) being the first year that High Rise outsold Low Rise. Immigration is the #1 source of the population growth in the GTA. According to Statistics Canada, there are roughly 260,000 to 280,000 new people to Canada each year – NET migration (foreign and domestic immigrants minus emigrants). These new people are not moving to rural Saskatchewan and Manitoba – they’re moving to the big cities such as Toronto, Vancouver and Montreal. In fact, Toronto receives 100,000 to 150,000 each year. We have for the past 10 years, and according to Statistics Canada, we can expect the same for the next 10-20 years. To house these new people, the Greater Toronto Area (GTA) requires roughly 40,000 new homes each year, or 1 home per 2.5 people. 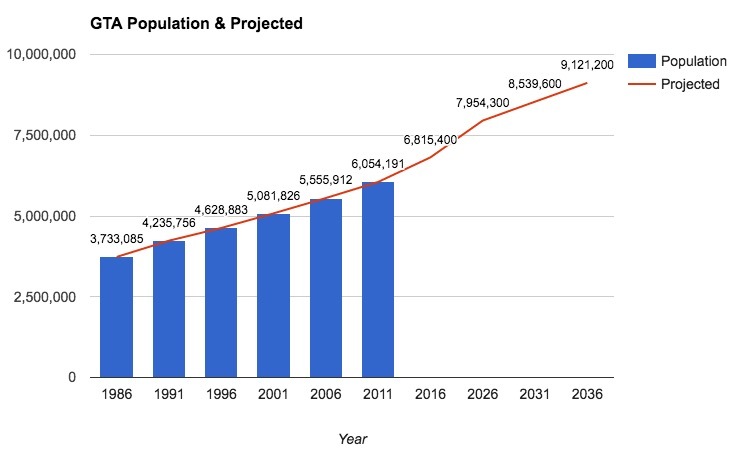 The graph below shows the population of the GTA as reported by Statistics Canada, and also highlights the projected growth. 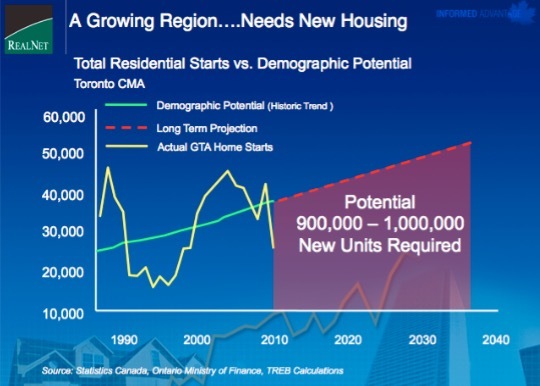 It is expected that by 2036, the population of the GTA is surpass 9 million people. What that means is that over the next 20 years, Statistics Canada is predicting almost 2 million new people in the GTA which means we need to build 800,000 new homes (assuming the average of 2.5 people per household) to house all of these people JUST to satisfy the demand from immigration. This information, coupled with the Greenbelt legislation that we already discussed means that there will be further densification and urbanization as we are forced to continue to “grow up” and not “out”. One of the biggest myths is that we are creating too much condominium supply in Toronto. What the “myth” doesn’t take into consideration is how much need for housing there is in the City. One of the key factors that we look at is the rapid growth of the Rental market which has quadrupled in the last 10 years. 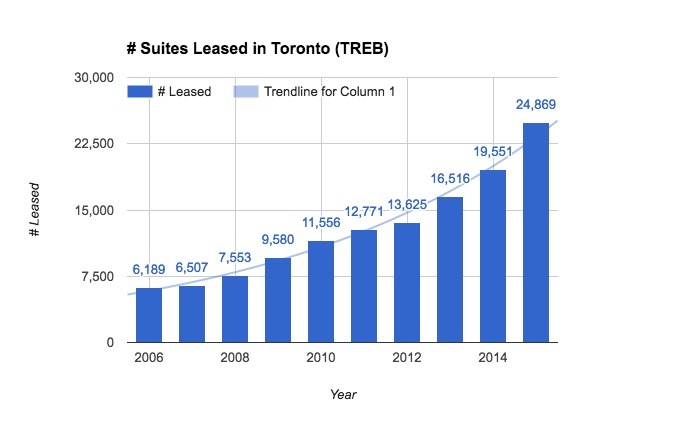 In 2006, the Toronto Real Estate Board (TREB) recorded 6,189 rentals which has grown every year since. Last year there were 24,869 rentals which represented an incredible 400% growth in 10 years and a 27% increase from the previous year. Despite the number of rentals growing every year, we are also seeing upward pressure on pricing which indicates that demand for rentals is still outpacing supply. 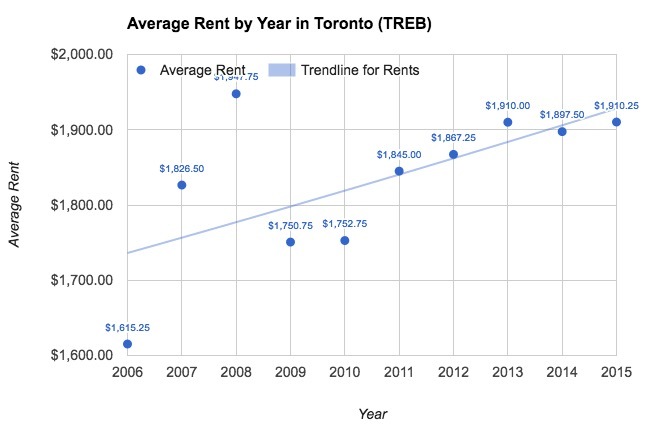 In 2015 the average rent in Toronto reached $1,910.25. One of the biggest differences between Toronto and other major cities is that there is NO RENT CONTROL. This means that for new condominiums, Landlords are free to increase rents from year to year based on market conditions instead of being tied to Rent Control rules. This gives the Landlord a great advantage in the Toronto rental market. In addition to the increased amount of rental suites and rental rates, we continue to see a very tight market with respect to vacancy rates. 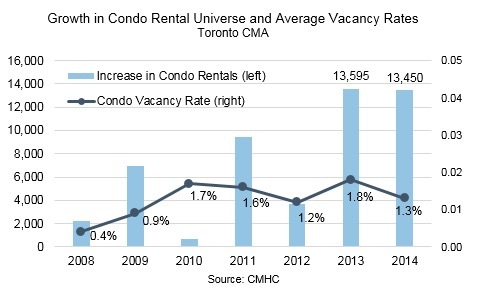 The vacancy rates in Toronto remain very low (in and around 1%) despite the increase of supply from the new condominiums. This tells us that the number of people coming into the city is on par, or higher than the supply of new condominiums being built. Prices in Toronto remain relatively affordable especially when compared to major economic hubs around the world. The graph below shows what you can get for $1 million (on average) in different major Cities across the world. City What do you get for $1 Million? The graph highlights how Toronto compares to other major Cities where $1 million is just a starter price point. In Monaco, perhaps the most expensive real estate market in the world, your suite would be 10 times smaller than in Toronto for the same price. What does this data tell us?